with Special Guests Micky Braun & Gary Braun of Micky and the Motor Cars. All four Braun Brothers on one stage! Whole Roasted Pig Tacos, Wood-Fired Pizzas, Estate Wines & Local Craft Beer Available for Purchase. 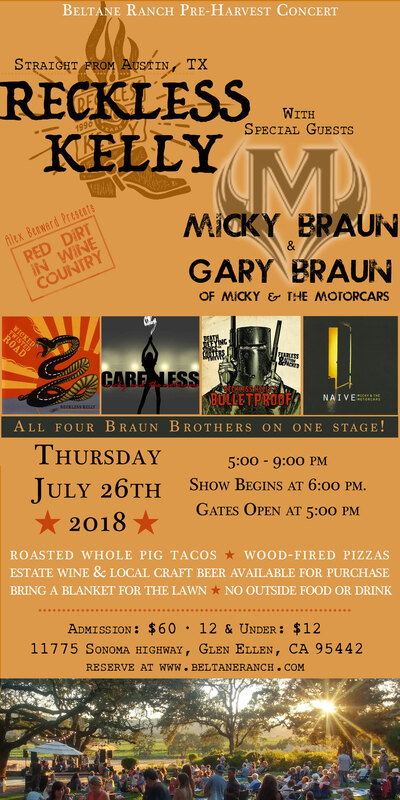 You’re invited for an intimate evening on the lawn with a private sunset show of genuine red dirt country. Includes private area with Restoration Hardware Couch, Additional chairs, Table Service, Cheese & Charcuterie Board and In-Suite Infused Water and Ice Tea.